The Page Break Preview feature in Excel 2010 helps you spot and fix page break problems in an instant, such as when the program wants to split onto different pages information that you know should always appear on the same page. Click the Page Break Preview button on the View tab. If the Welcome to Page Break Preview alert dialog box appears, click OK.
Before you click OK, you have the option to tell Excel not to show you that dialog box again. Position the mouse pointer on the page break indicator (one of the blue lines surrounding the page) that you need to adjust; when the pointer changes to a double-headed arrow, drag the page break indicator to the desired position and release the mouse button. 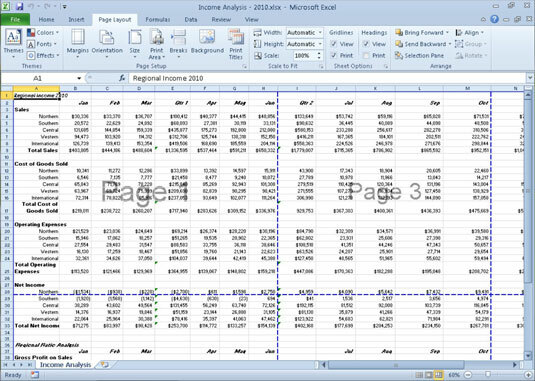 Excel adjusts the display based on the new location of the page break. Repeat this step as needed. After you finish adjusting the page breaks in Page Break Preview, click the Normal button on the View tab. Excel returns the worksheet to its regular view of the data. Press Ctrl+P to preview the worksheet in the Print panel to see if further adjustments are needed. You can also insert your own manual page break at the cell cursor’s position by selecting Breaks→Insert Page Break on the Page Layout tab. Remove manual page breaks by selecting Breaks→Remove Page Break on the Breaks menu. To remove all manual page breaks that you’ve inserted into a report, select Breaks→Reset All Page Breaks on the Page Layout tab.